“The great creator god Ptah has the power to imagine a new world and opens the mouth of creation to issue it forth. A lover of this world, this existence, and all things manifest, he is also a prophet and a seer of the future aeons. He holds the potential of a Golden Age in his mind’s eye. We humans are entrusted with his imaginings and have the potential to embody, enact, and create them. When we can tap into his vision, he helps his ability to speak things into being. His dominion reaches down through the earth, into the Underworld, or Innerworld, and all the way up into the cosmos and the Akashic realms, including all spaces in between. Ptah was revered by the ancient craftsmen, artists, and builders of the monuments of Egypt, for the assisted the in manifesting their co-created dreams, providing ideas and tools. 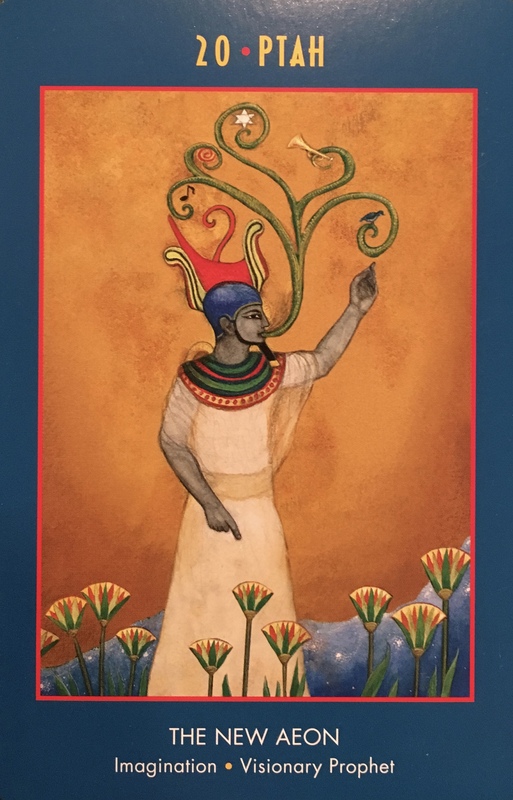 If you have drawn this card, you are connecting with Ptah and being asked to open your mouth, to speak your truth as you have seen if from your highest visions, and to help to co-create a new era with your right speech and right actions. This applies to you personally and to whatever situation or question you bring to the oracle; it also applies to the greater collective vision of the future of our world. You are being asked to see clearly with your heart and into your heart, and to bring forth all creations through the channel of your heart and mind. Now we take our manifestation efforts to a new level of creation. We are going to speak them into existence. Affirmations are extremely valuable tools for this process. We can use affirmations to teach our brains to think differently; it quite literally helps us to build new neural pathways. When we change the chemistry of our brains in this way, for the positive, we change our personality for the better. We can expand our belief systems, embrace more possibility and release the blockages that have been holding us back. We can form a new lens in which to see our reality, one that is not based on past pain and mistakes, but instead based on infinite possibility and success. Where are you struggling in your life with your manifestation? We have talked about this several times lately, but as it has come up again, I believe it is important to address it again. Do you use the power of your voice to assist you in bringing your dreams to reality? Or do you use your voice to complain, state your worries, or berate yourself for previous mistakes? Stating aloud what you intend to manifest tells the Universe that you are serious about your dreams and desires. Using your voice to state affirmations aloud helps to expedite the process by boosting confidence and self-worth. In a journal or notebook, write out your top three intentions, and read them out loud (in front of a mirror works really well too!) every morning and every night for 30 days. Also say them aloud during the day whenever you get the chance, you can’t do it too often! Each evening write anything in your journal that pertains to the achieving of your goals. Note any synchronicities, opportunities or chance encounters which have lead you closer to your dreams. At the end of the month, read over your journal and celebrate your victories; see how much closer you are to what you wish to create. Rewrite or add more intentions as needed, and continue to manifest your dreams.